Players understand that basketball is a business and the show goes on. But that doesn’t mean it’s easy. Pacers star Victor Oladipo went down with a gruesome non-contact knee injury so bad that his team’s athletic trainer immediately covered it with a towel. He has a ruptured quad tendon in his right leg and his season is officially over. Just like that. With Oladipo laying helplessly on the floor and Pacers fans silent in awe, his teammates could only stand around him thinking nothing but the worst. 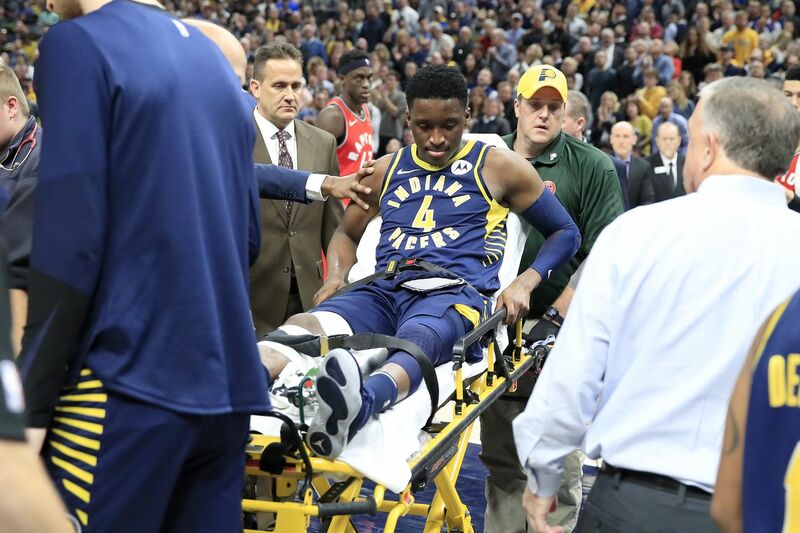 Myles Turner’s eyes glazed to the ground, then to the sky as Oladipo was wheeled in a stretcher. Domantas Sabonis held his face in his hands as Oladipo wiped away tears. Then, minutes later, after witnessing one of the most devastating moments of their careers, it was time to play on. With millions of dollars on the line and a chase for the postseason ahead, a heckuva lot rides on each NBA game. There’s no time for players to dwell on every emotion and process every fear running through their brains. But it’s also impossible to return to status quo in an instant after one of their own goes down like that. Athletes are still human. The Brooklyn Nets who watched Caris LeVert suffer a similar fall in mid-November know it best. Jared Dudley sat on the baseline on the bench, right in front of where LeVert’s leg dislocated. He’d gotten a clear view of former Suns teammate Isaiah Canaan’s broken leg the year before, too, but seeing one traumatic incident doesn’t prepare you for the next. Dudley admitted it’s a lot harder than it looks to just play on. Staying genuinely positive in the moments after a teammate who you spend almost every day with for up to nine months a year is an unrealistic expectation. “You think the worst when you see it,” Joe Harris told SB Nation. It could’ve, and it still can be, as players are suddenly reminded. The memories and images of the injury aren’t washed away the morning after, either. The news cycle may start to die down, but the moment doesn’t end for those who’ve seen. The outcome could have been worse for LeVert and the Nets. He escaped major injury by avoiding fracturing his leg, and he had minimal ligament damage. He might even return this season, which made a difference to Harris. The rally on mentality isn’t an option. It’s a job requirement. And with players getting more and more athletic, running with a quicker pace, these injuries are bound to continue. For Oladipo, it’ll be a much longer road to recovery. His teammates will play knowing that his season is over, and for him to return to the same level of play isn’t a given. It’s grim, but players have to find their own ways to move on. As Burke said, it has to be business as usual.